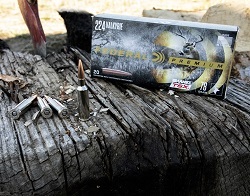 ANOKA, Minnesota - January 18, 2019 - The industry’s number one new caliber from the number one rifle ammunition brand continues to grow. Federal expands its options for 224 Valkyrie with three new loads: 80.5-grain Gold Medal Berger Hybrid, 60-grain Hornady V-Max and 78-grain Barnes Triple-Shock X (TSX). All will be on display during the 2019 SHOT Show (Booth No. 14551), January 22-25 at the Sands Expo Center in Las Vegas, Nevada.